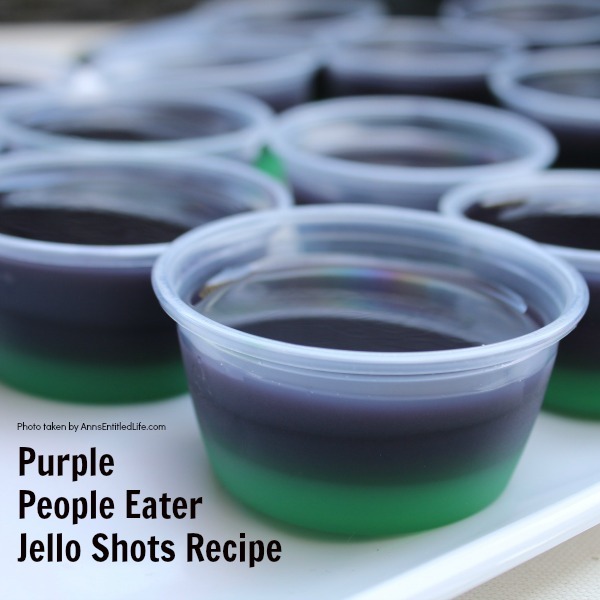 This Purple People Eater Jello Shot recipe is a taste of Halloween in a party shot! 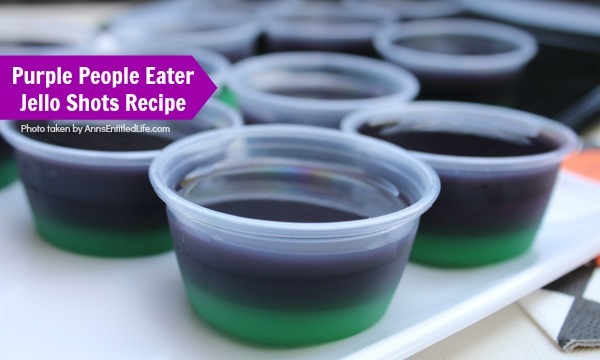 Simple to make, these Purple People Eater Jello Shots are great for parties, tailgating, and more! • Heat one cup water to a rolling boil. • Add one packet unflavored gelatin; whisk until dissolved. 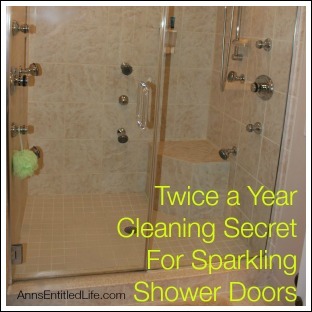 • Allow to set away from heat for 10 minutes. • Add several drops of green food dye. • Add one cup apple liquor; whisk to combine. • Fill 24 two-ounce shot containers (disposable soufflé containers were used) 1/3 of the way full. • Refrigerate until set (1-2 hours). • When the green apple layer is set, heat one cup of water to a rolling boil. 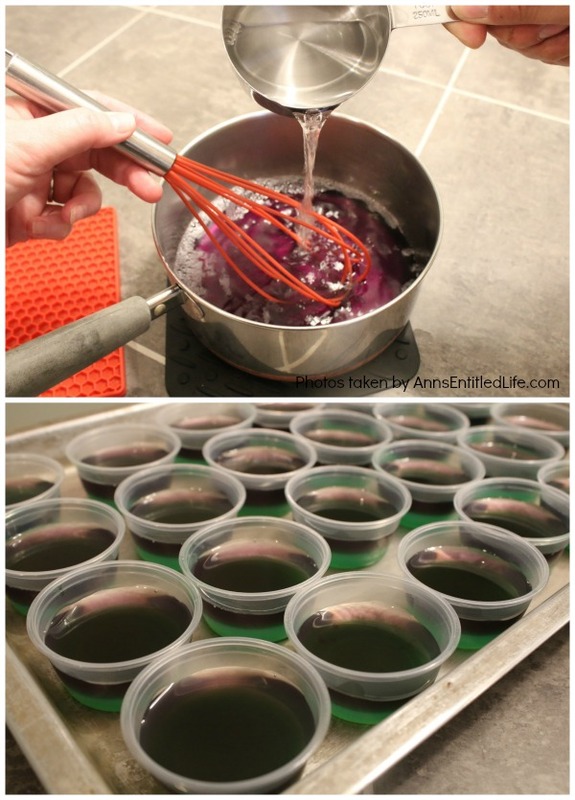 • Add one small box of grape flavored gelatin; whisk until dissolved. • Add one cup tequila; whisk to combine. • Fill 24 two-ounce shot containers (disposable soufflé containers were used) 2/3 of the way full (so another 1/3). • When the purple tequila layer is set, heat one cup of water to a rolling boil. 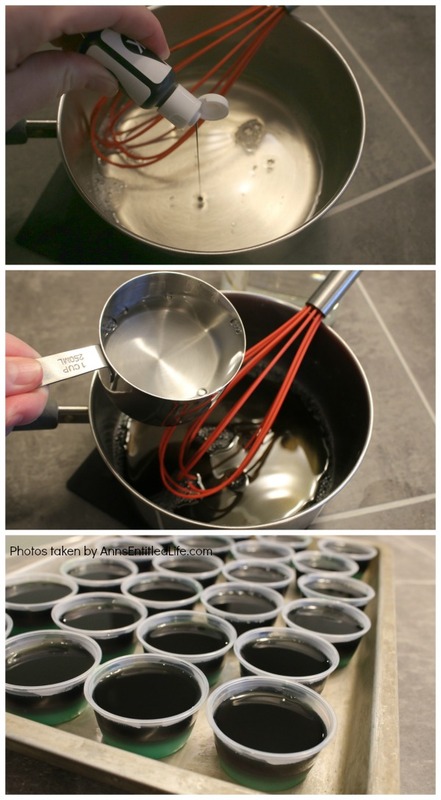 • Add several drops of black food dye. • Add one cup clear rum; whisk to combine. 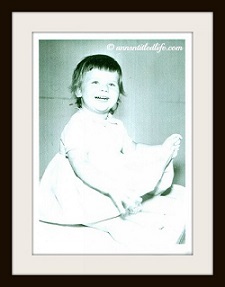 • Fill 24 two-ounce shot containers (disposable soufflé containers were used, so to the top). 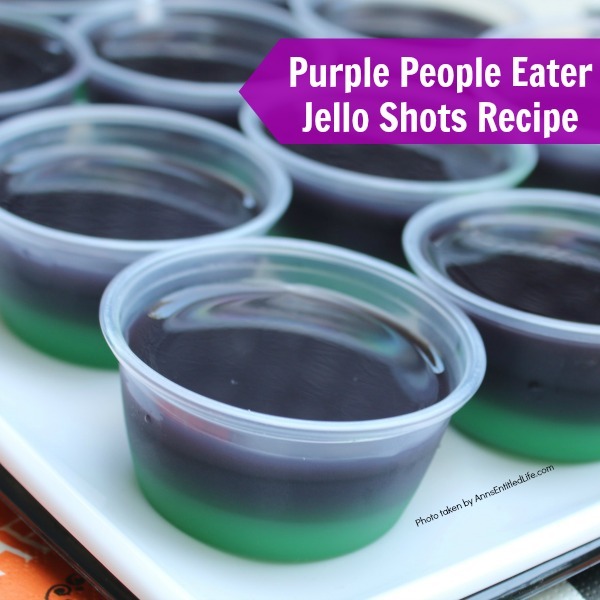 • If you would like these to be “one-eyed” Purple People Eater Jello Shots, add a candy eye to the top of each shot cup. 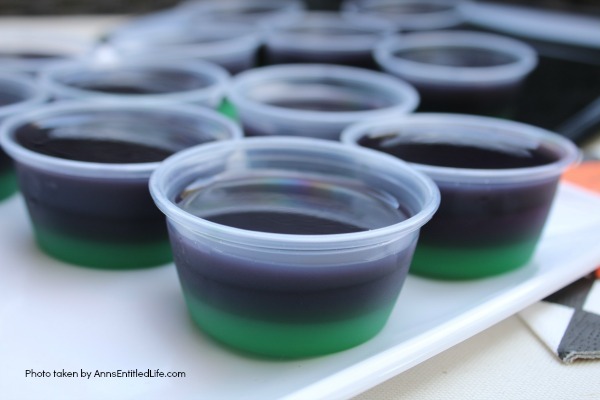 A great Halloween party jello shot, these Purple People Eater Jello Shots are easy to make and taste great! 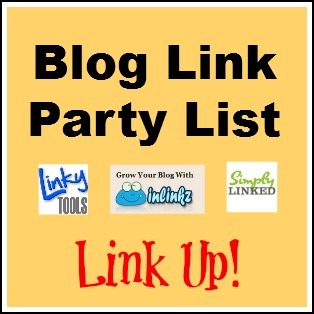 Jello shots are very popular party “drinks”. Everywhere you turn someone has a Jello shot recipe. 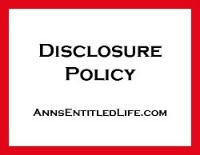 But, in a bit of irony, most “Jello” shot recipes are not made with “Jello” (Kraft) at all… they are made with unflavored gelatin, usually Knox (Unilever) or store brand. While researching gelatin shots recipes, I spent some time on the Knox gelatin page, and the read is fascinating. It is the largest distributor of gelatin selling 60% for home and institutional usage, and 40% to industrial and manufacturing. Knox really took off after the owner died and his wife took over the company. If you have a few minutes, give it a read. I learned some things (the first gelcap in the 1920s! 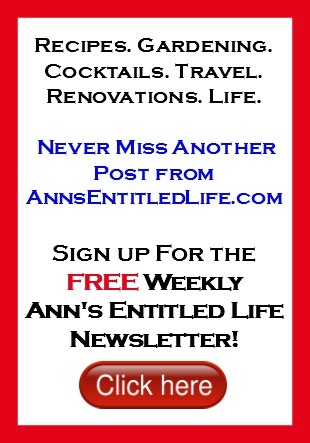 ), and you may too. The 1 cup of some sort of spirits is the key. 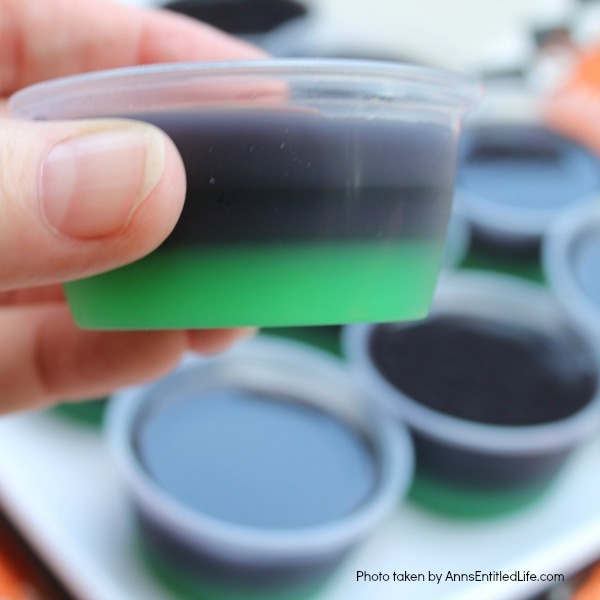 The different flavor combinations of alcoholic beverages combined with the flavored gelatin are what makes the tasty jello shot varieties. 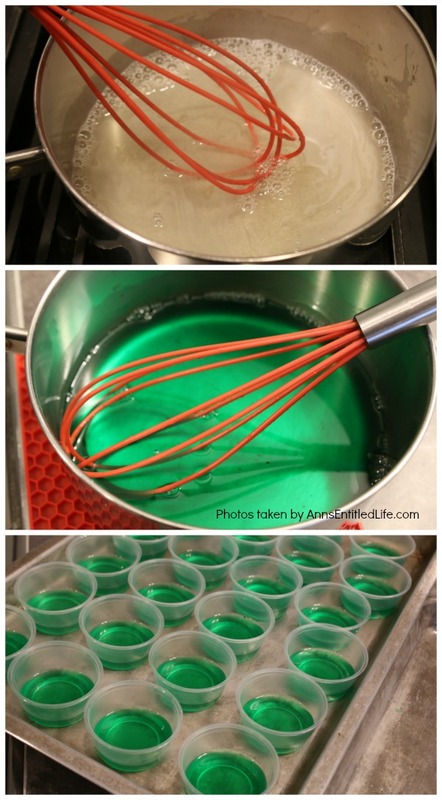 • Make sure you add the food coloring after you have allowed the gelatin mixture to set up for 10 minutes (so it is not super-hot), but before you add the liquor. 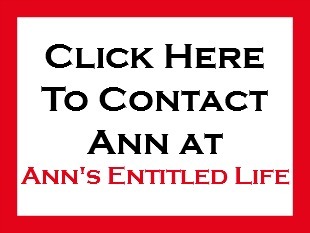 So many problems are avoided when you do it this way! • The color order does not matter – these are green, purple, black. You can do black, green, purple or purple, black, green… whatever you like. 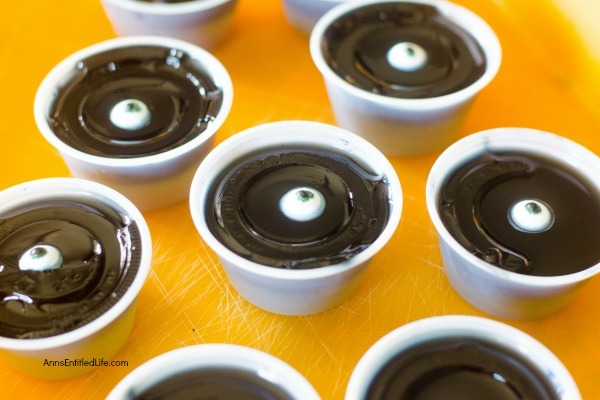 • When you fill the final 24 with black rum gelatin, make sure you fill all the cups at least a little bit and then go back and top them off. There is enough liquid to fill them all, but it works better for the final layer to do a little, and then top off. • These are strong. The tequila really gives a kick. If you are not a tequila fan, use more apple or rum or substitute vodka. This recipe originally called for green apple jello. Try finding it. I had no luck, so totally remade the recipe with flavors that are accessible to all. 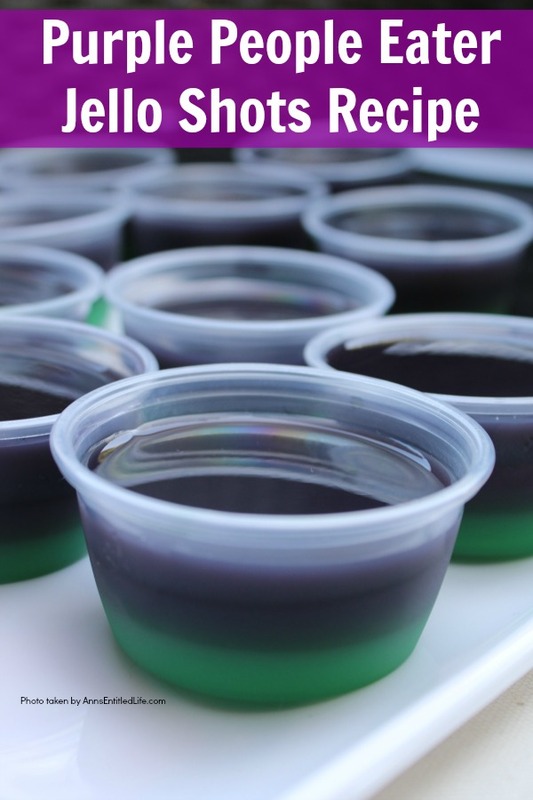 • To print the Purple People Eater Jello Shots recipe, click here.